Could water treat polycystic kidney disease? A team of clinicians and researchers from Westmead Hospital and the Westmead Institute for Medical Research are working together to investigate the effectiveness of water in treating polycystic kidney disease. A cheap, safe and effective treatment to polycystic kidney disease may soon be available, thanks to a new national clinical out of Westmead, which is trialing water to treat the disease. The trial, known as PREVENT-ADPKD, will investigate whether drinking the right amount of can prevent adult polycystic kidney disease (ADPKD) progressing to kidney failure. ADPKD is an inherited disease in which the kidneys deteriorate because of cysts that grow and destroy healthy tissue. The study team – led by Dr Annette Wong, Carly Mannix, Professor David Harris and Dr Gopi Rangan – at the Westmead Hospital and the Westmead Institute for Medical Research are optimistic that drinking water is an effective treatment to reduce kidney cyst growth in ADPKD patients. “Water stops the hormone that makes these cysts grow, so ensuring you aren’t thirsty reduces the chance of cysts growing,” Dr Rangan said. “This is important, because there is no cure for polycystic kidney disease. More than 50 per cent of patients eventually develop kidney failure, requiring dialysis or kidney transplantation. “If successful, our approach could have major benefits for the health of people with ADPKD. If we can slow the disease at an early stage, we could potentially prevent kidney failure occurring altogether. “A positive study result will show that water is a cheap, safe and effective treatment,” he explained. The team’s previous research showed that increased water intake was highly effective at reducing cyst growth in animals with polycystic kidney disease. This new study protocol, published in BMJ Open, will be the first of its kind to provide evidence on whether prescribed water intake is an effective treatment for ADPKD in humans. 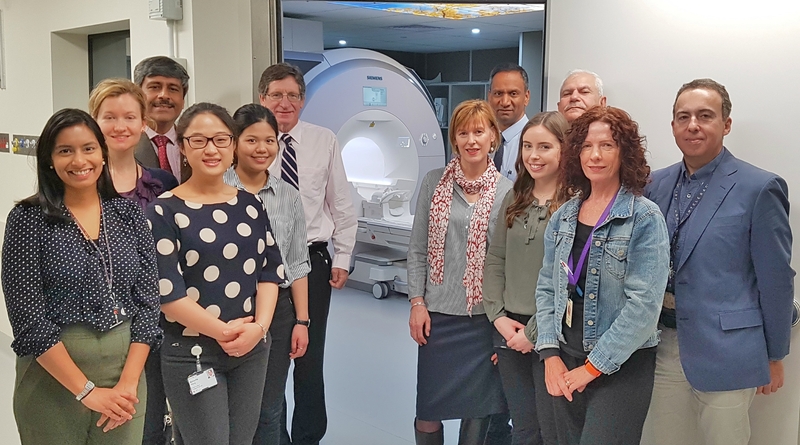 The three-year randomised controlled clinical trial will use MRI to assess the rate of cyst growth in the kidney throughout the study. Patients with ADPKD develop hundreds of cysts in the kidney, which form in early childhood and grow by five to ten per cent each year. It is the most common genetic kidney disease in adults, affecting one in every 2500 individuals. More than 2000 Australians with ADPKD currently receive dialysis or need a kidney transplant. More than 240 people have already enrolled in the trial, and full results will be available in 2020.